FCA Design concepts mix with the wild and fun rides from car fans at the FCA Design Cars and Coffee event. Whether it’s lovingly restored and coddled or a work in progress, the special car in your garage is likely an object of affection for other car fans. Give them a chance to see your four-wheeled classic or modern masterpiece – all makes and models are welcome – at 2018 FCA Design Cars and Coffee show on Sunday, June 3, from 9 a.m. to noon. 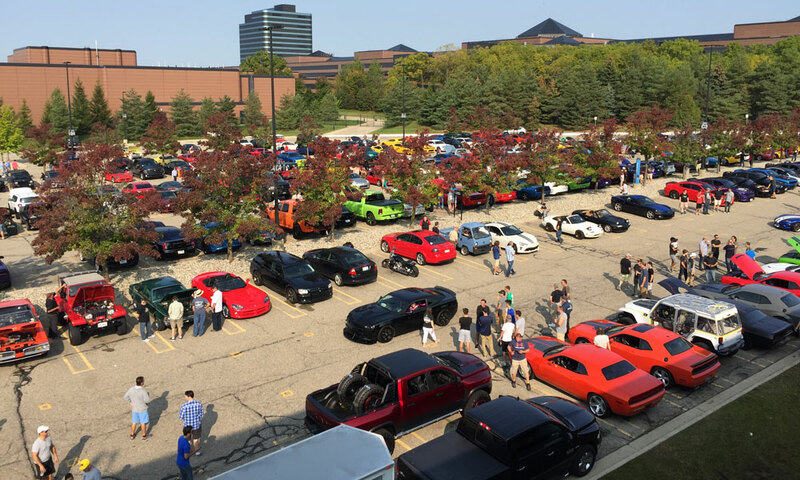 We’ve got a big parking lot at the FCA US complex in Auburn Hills, Michigan, open for the event. 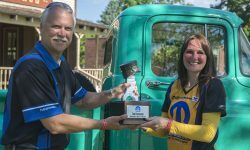 The Jeep Wagoneer Roadtrip concept will be at the 2018 FCA Design Cars and Coffee on June 3. SpringFest 13 Dodge Challenger T/A: A special 2018 Dodge Challenger T/A created for this year’s Spring Festival of LX gathering in southern California. Painted a unique color, Fortuno’s Gold, named for SpringFest organizer John Fortuno, along with a Shaker hood and matte black decklid, roof and hood. Classic 1970 Dodge Challenger T/A: A true blast from the past, inspiration for modern muscle. Jeep® Wagoneer Roadtrip: Created for the 2018 Easter Jeep Safari, this is a 1965 Jeep Wagoneer that was stretched and updated yet retains the heritage Wagoneer look. The off-roading upgrades include a boxed and reinforced frame, Dana 44 axles front and rear, four-link suspension with coilover springs and 33-inch mud/terrain tires. 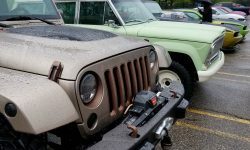 Jeep Quicksand: Created for the 2017 Easter Jeep Safari, the Quicksand is loud and fast. A Mopar 392 Crate HEMI® V-8 with eight-stack injection lives under the hood, mated to a six-speed manual transmission. The off-road cred includes a staggered front/rear tire setup, coilover shocks and 37-inch tires. It won’t surprise us if the designers “borrow” the keys to a couple other vehicles that add to the Cars and Coffee wow factor. Plus, here’s a chance to check out some of the high-octane that people inside FCA like to drive and keep in their garages. Place: Lot 25 in the FCA US complex in Auburn Hills, Michigan. Check the map to navigate your way to the lot. Cars: All makes and models welcome (yes, really!). Check out some Dodge and Jeep concepts. Coffee: Available for purchase on site, along with water and some food. Or bring your own. Rules: Be respectful. No burnouts! Let us know you’re coming at the FCA Design Cars and Coffee events page on Facebook. 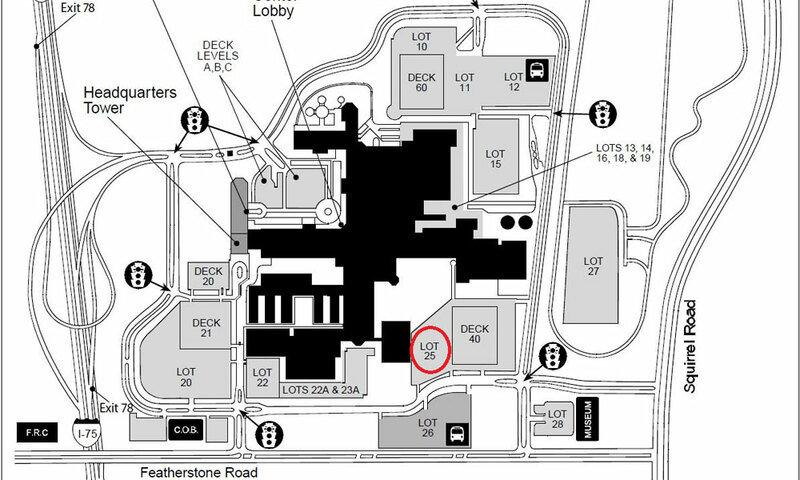 Lot 25 (circled) is the site for the 2018 FCA Design Cars and Coffee at the FCA US campus.